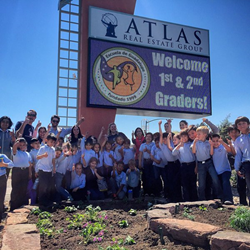 Denver's Atlas Real Estate Group celebrates the coming of spring with Escuela de Guadalupe's first and second grade classes. 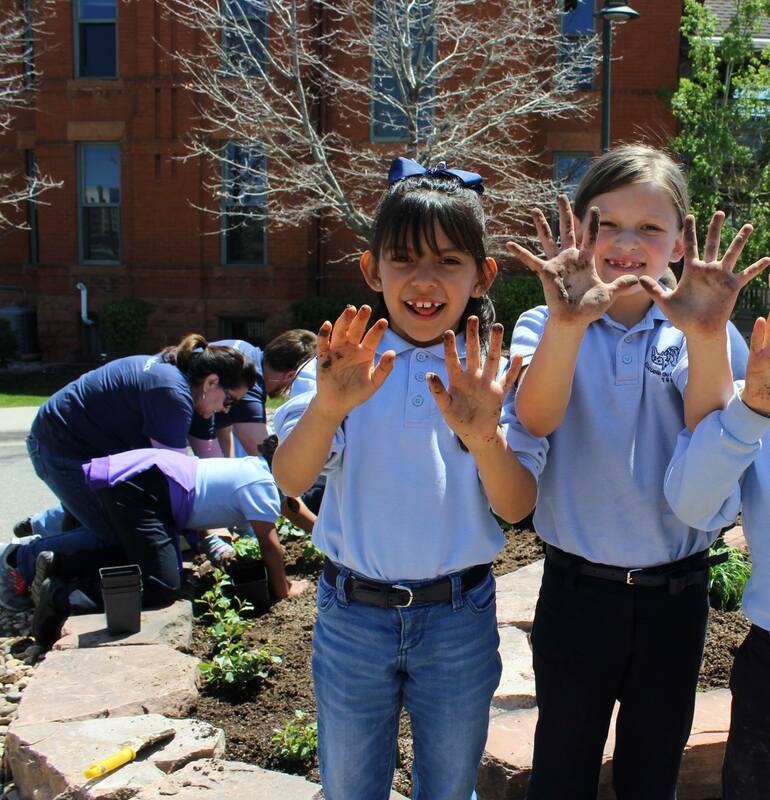 During a bilingual field trip filled with lessons on the importance of water conservation and planting xeric (low water) plants, together the groups planted over 50 xeric plants in the new Atlas garden designed specifically for the school children. Atlas Real Estate Team and Escuela de Guadalupe Students Gather Around New Xeriscape Garden They Planted Together. Atlas Real Estate Group employees, Massey, and the Escuela de Guadalupe students got their hands dirty while planting over 50 xeric plants in the new Atlas garden designed especially for the children. To celebrate spring, the environment, and early childhood education, local real estate firm Atlas Real Estate Group hosted 36 first and second grade students from Escuela de Guadalupe, a small, bilingual Catholic elementary school in west Denver, for a field trip filled with lessons on the importance of water conservation and planting xeric (low water) plants. Ara Massey, Director of Sustainability for Hord Coplan Macht, a commercial architecture firm located in downtown Denver, led the xeriscape and water conservation presentation while Atlas founder Ryan Boykin helped to translate the presentation into Spanish. Students learned which home utilities and appliances use the most water, and how they, as individuals, can contribute to water conservation at home on a daily basis. 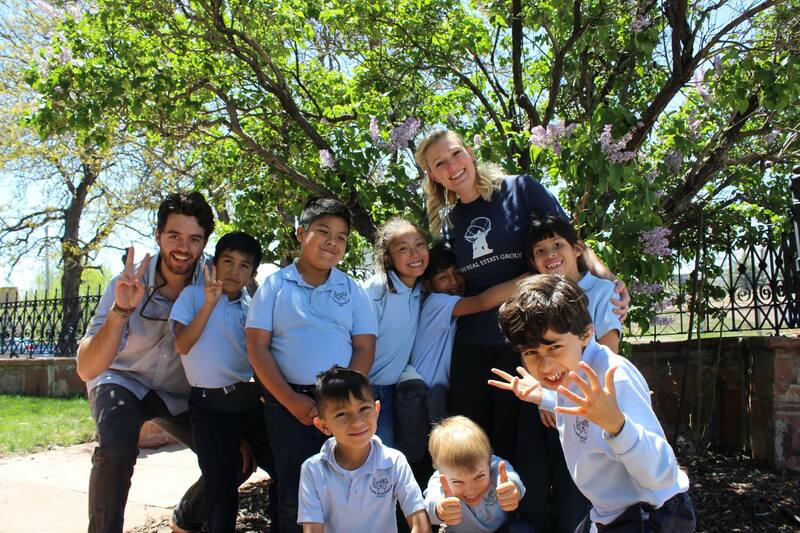 Massey also taught the Escuela de Guadalupe students about the beautiful drought-resistant perennials they would be planting and the benefits of xeriscaping, especially in a high desert climate like Colorado. Post presentation, Atlas Real Estate Group employees, Massey, and the Escuela de Guadalupe students got their hands dirty while planting over 50 xeric plants in the new Atlas garden designed especially for the children. Atlas ordered the xeric plants from the Center for ReSource Conservation, a local organization whose programs like Garden in a Box provide impactful and powerful ways to conserve natural resources, in partnership with local and regional water utilities committed to water conservation. In addition to the valuable lessons the children learned about sustaining the earth’s precious resources, they learned how to plant a garden in a fun and interactive way. The Atlas team believes that experiential activities like this contribute to students’ personal development and create generations of kids more connected to their environment and engaged in nurturing a healthy planet. Atlas team members hosted the field trip as part of their “#AtlasGivesBack” program, a monthly volunteer initiative that is near and dear to them, to give back to the community in which they are deeply involved. Highlights of recent community involvement include: a clothing and personal care items drive for The Samaritan House downtown, serving dinner at the Denver Rescue Mission homeless shelter, and donating over 3,415 lbs of non-perishable food items to Food Bank of the Rockies. This month, the Atlas Real Estate team will volunteer together to prepare and serve dinner at the Denver Children’s Home. Enjoy more photos of the field trip at http://www.facebook.com/AtlasRealEstateGroup. Founded in 2008, Atlas is a full service realty group, specializing in real estate investments, brokerage, and property management. Atlas was founded by principals who have personally owned and managed over 1,000 residential and commercial properties. The company was built on the belief that in order to serve and understand a client’s needs effectively, you first need to understand their perspective as an owner of real estate. Atlas’s principals and employees empower individuals to plan, purchase, and build a financial future that fits their aspirations; Atlas’s passion is using real estate to make that happen. To learn more about the full scope of Atlas, visit http://www.RealAtlas.com. 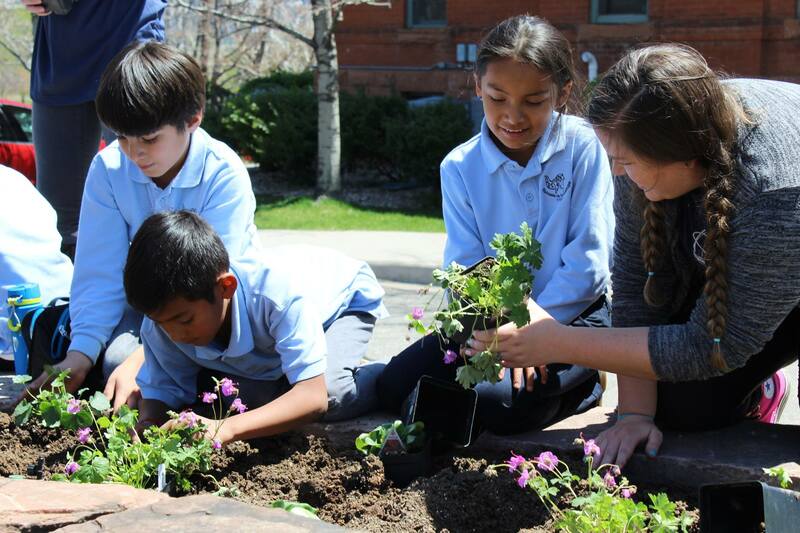 Atlas Real Estate Group team member helps Escuela de Guadalupe second grader learn to plant xeric (low water) plants. Atlas Real Estate Group and Escuela de Guadalupe first and second graders wait for their turn to plant in the new xeriscape garden. Escuela de Guadalupe students show off their dirty hands after learning to plant xeric (low water) plants with Atlas Real Estate Group team members.